Selected Shortridge Magnet High School students will get a jumpstart on their college careers, thanks to a grant from Central Indiana Teachers Credit Union (TCU). ECP participants with Butler and TCU representatives, left to right, José Lusende, Laebrionna Wooden, Robert Shula, Laura Feeney, Jodeci Byrd, Terrence Jackson, Mary Macmanus Ramsbottom, Mitch Still MBA ’09, Justina Fields, Lori Norris, and Daniel Cole. 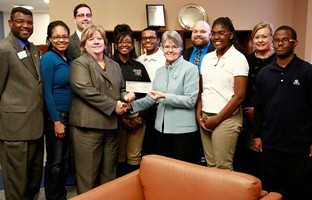 Laura Feeney, vice president for TCU in central Indiana, presented the $8,300 grant to Butler University on Feb. 15 to create the TCU Scholars program. The grant will cover costs for one Shortridge student to earn up to 13 college credits in Butler’s Early College Program (ECP) across four semesters. Twenty-three Shortridge juniors and seniors have participated in ECP since it began in fall 2011. Butler’s Early College initiative is “the type of innovative program we need more of,” Feeney said. The program gives Shortridge honors students the experience of being on a college campus and learning alongside university students in regular classes taught by Butler faculty. Given its focus on serving educators, TCU likes supporting local school programs, she said. “We work very closely with Indianapolis Public Schools” (IPS). Being “a proud Butler alum,” Still said, he helped bring Shortridge and Butler to TCU’s attention when he became the Central Indiana division’s service center manager two years ago. TCU initially helped sponsor the Butler Leadership Camp, he said. Shortridge students and teens from across the country have taken part in the summer camps for the past three years, learning leadership principles embodied in The Butler Way. Butler Associate Provost for Student Academic Affairs Mary Macmanus Ramsbottom serves as administrative liaison and director for the ECP. She thanked TCU for the grant and noted the genuine interest TCU partners have shown in the ECP students. She said Still and Robert Shula, director of public relations for TCU, met with ECP students to talk about their own college days and career pathways. The high school students paid close attention when the men recalled being in college and struggling to balance classes and with working full or part time to meet expenses, Ramsbottom said. TCU’s grant will help the next group of Shortridge students excel in the Early College Program, she said. “Butler loves having community partners like Teachers Credit Union,” she said.